Award-winning writer Ben Bova returns with Power Failure, another tense political thriller starring Jake Ross, science advisor to Senator Frank Tomlinson, as they continue their complex power maneuvers in this near future science fiction novel. Dr. Jake Ross came to Washington to try to make a difference, but he’s learned the only way to get something done in Washington, assuming your ideals survive the corrosive atmosphere, is to gather power. Ross has gathered a great deal, riding in the wake of Frank Tomlinson. But now Tomlinson has decided to shoot for the moon. If they win, they get it all. If they lose, the game is over for Jake Ross. In the Power trilogy, Bova's vision of a future powered by solar satellite transmission is tantalizingly within reach. Jake Ross glanced down at his wife. Tami had never seen the Tomlinson mansion before. 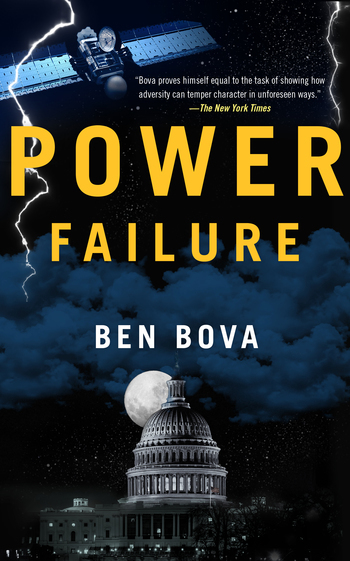 BEN BOVA, author of Power Surge and Power Play, is a six-time winner of the Hugo Award, a former editor of Analog, former editorial director of Omni, and a past president of both the National Space Society and the Science Fiction Writers of America. Bova is the author of more than a hundred works of science fact and fiction. He lives in Florida.